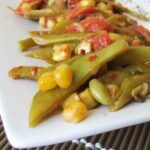 Green beans are in season but don’t you know how to make your kids, even your husband love these healthy greenness? Fried Green Beans will be your ultimate recipe to solve this problem. I guarantee they will ask for more and you will surprisingly find yourself making these addictive appetizers quite often. 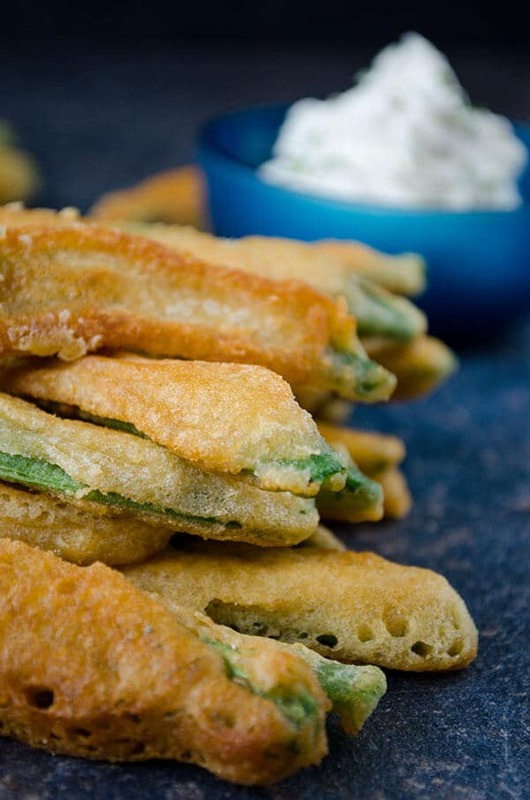 These fried green beans are the healthy alternatives to french fries just like Zucchini Sticks. You can pair these with cold beer. I would make these on a game day when you have friends and serve these with cold beer and see how everyone loves them. The best part of this recipe is that you don’t need any slicing or chopping steps, just trim the ends. If the beans you are using are very fresh and with no string at all, they don’t need anything at all. You can directly coat them with the batter you prepare. You can use this batter for other vegetbales like cauliflower or zucchini. These fried green beans are golden on the outside and vibrant green on the inside. It keeps that lovely greenness thanks to a large bowl full of icy water. I know fried foods are not healthy but if there are green beans inside, it has to do something with health. This kind of fries are mostly paired with a yogurt sauce, I did the same but with an addition of mascarpone cheese. I highly recommend you to try this sauce with these fried beans, you will probably want to pair your regular french fries with this sauce too. The healthy alternative to regular french fries. These fried green beans are equally tasty! Bring a pot of salted water to boil. Toss in green beans and cook for 3 minutes. Transfer them directly into a large bowl full of ice and water. This will help the beans keep their lovely green color. Let them sit there for a few minutes and take them on a paper towl. Pat dry and put aside. Whisk eggs and mix other ingredients except oil until smooth. The batter will be as thick as a regular cake batter. Coat the beans with the batter and then fry in the oil golden for about 30 seconds on each side. Take them on paper towel to remove excessive oil. Mix everything fort he sauce and servet he fried green beans with that sauce. This looks like such a delicious snack, great recipe!